Anyone following the recent string of articles in the mainstream press attacking the UN’s Intergovernmental Panel on Climate Change (IPCC) may have entertained a sneaking suspicion that the hidden hand of the climate denial lobby was at work behind many of them. That suspicion, it turns out, is exactly right – the fingerprints of the deniers are all over several of the key stories. This latest feeding frenzy kicked off when one erroneous claim – that Himalayan glaciers were “very likely” to disappear by 2035 – was found to have slipped through the net, the IPCC’s extensive review process having failed to weed it out prior to publication. The claim was included on page 493 of the IPCC’s second 1000-page Working Group report on “Impacts, Adaptation and Vulnerability” (WGII). The reference given was to a WWF report – part of the non-peer-reviewed “grey literature” that makes up a periphery of the material in the second Working Group’s report. Marginal as it may have been, for the media this isolated error appears to have opened the floodgates. 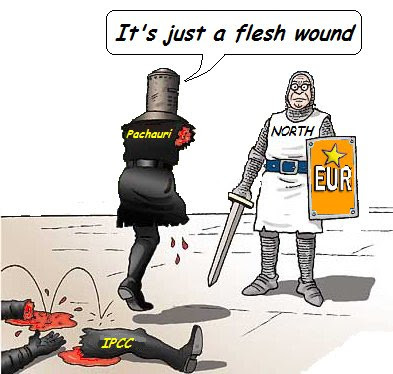 A hysterical flurry of activity followed, as the denial lobby began trawling through the IPCC report for anything else that might look bad – particularly anything referencing the grey literature. The results of this search were then fed to elements of the press, who eagerly snatched them up – uncritically repeating many of their claims in the process. Christopher Booker, North’s co-writer on the book, has himself claimed that white asbestos is “chemically identical to talcum powder”, receiving repeated condemnations from the UK’s Health and Safety Executive for his “misinformed” and “substantially misleading” articles on the subject. He has also denied the link between passive smoking and lung cancer, between BSE and CJD in humans, and, astonishingly, claimed that proponents of Darwinian evolutionary theory “rest their case on nothing more than blind faith and unexamined a priori assumptions”. One might have expected such corners of crankery to be passed over by most mainstream journalists, or at least left to fester on the Telegraph’s comment pages. But these sources are not only being read – they are finding their “research” used as the foundation for major news stories. Yet the fourteenth page of WWF’s report had stated exactly that. “Up to 40% of the Brazilian forest is extremely sensitive to small reductions in the amount of rainfall”, the report noted. Nevertheless, North went to town, declaring the unearthing of “Amazongate”. He accused the IPCC of making “false predictions on the Amazon rain forests”; of producing “a complete fabrication”; stated that “the IPCC has grossly exaggerated the effects of global warming on the Amazon rain forest”; that it “wanted to hype up crisis” by “making an assertion unsupported by the “science” it holds as so important”. A few days later, the story found its way onto the news pages of the Times, via reporter Jonathan Leake. “UN climate panel shamed by bogus rainforest claim”, the story’s headline declared, its first paragraph telling readers the IPCC’s statement on the Amazon was “based on an unsubstantiated claim”. The last line of the article leaves us in no doubt as to its source: “Research by Richard North”. “The IPCC statement is basically correct but poorly written, and bizarrely referenced. Lewis, it turns out, had sent both Leake and Harrabin the same email. But while Harrabin had included Lewis’s comments on the IPCC’s accuracy in his BBC piece, Leake simply ignored them. Instead, he seems to have invented his own, more congenial version of reality. “4000-page report makes insignificant referencing error” is admittedly a rather less powerful headline – even if it does possess the distinct advantage of being true. To give him some credit, Leake’s “bogus” headline has now been changed – though his “unsubstantiated” accusation remains. Meanwhile, things have gone full circle: the story is being cited in its original form on the website of climate deniers – and mining industry front-group – the Global Warming Policy Foundation, replete with the added credibility its status as a Times story gives it. While it is wholly unsurprising that the denial lobby should be attempting to push baseless and misleading stories to the press, what is surprising is the press’s willingness to swallow them. In this case, two experts in the relevant field told a Times journalist explicitly that, in spite of a minor referencing error, the IPCC had got its facts right. That journalist simply ignored them. Instead, he deliberately put out the opposite line – one fed to him by a prominent climate change denier – as fact. The implications are deeply disturbing, not only for our prospects of tackling climate change, but for basic standards of honesty and integrity in journalism. Worrying stuff. There was an equally disturbing story in the Independent on 10th Feb about a fake “alarmist” quote that has been wrongly attributed to John Houghton. It seems to be one of these Zombie arguments that no matter how ofter they are shot down, they get right back up again regardless! Each side of this debate are guilty of exaggerations. It is important for all readers to get a proper source. I still however have great reservations about AGW. lol! You people are the real ‘deniers’ – and at least 4 weeks behind the stack of ‘gate’ revelations. Please read my latest article proving that the crooks at GHCN falsified the raw data of the world’s second oldest uninterrupted climate record in the Czech Republic. Yes, folks, we now have ‘Czechgate’ – try waffling this baby away…. Thanks for that review, I got to this page via Real Climate. Well worth reading, and well put together. I don’t agree – and even your comment about “swallowing” all this rubbish underplays what is happening. Throughout the world, including here in New Zealand, the mainstream press and media have been one of the worst offenders in pushing a global warming denialist agenda. They are past masters at the misuse of the principle of “balance” with which they seek to disguise their active participation in this so-called “debate”. Without the cooperation of a complicit media, these denialilsts would never have had the traction they now have. I am not a believer in conspiracy theories, when either human stupidity or self-interest will explains surprising things adequately on their own. But conspiracy or not, the media’s role in casting doubt on valid science, not just once or twice, but as a matter of policy throughout the years, is one of the wonders of our age. It’s impossible for a normal compassionate and thinking human to understand the motives of those behind this attempt to usurp sound judgement and a care for our future, but there is in all powerful and ruling cliques, and that is what the press now is, this deep and pathological attachment to the staus quo, and a deep and abinding hatred of those that attempt to undermine it. That the status quo could be taking us to disaster is not a subject for discussion or understanding. I imagine much the same happened in the press in Europe before the First World War. But there was no research referenced linking climate change to a reduction in rainfall in the Amazon; the referenced research, if you tracked it back, was talking about how logging, agriculture, and fire were increasing the risk of drought damage in 40% of the forest. The point is not wherefore the dryness occurs but what happens IF it occurs. Dryness of the Amazon rainforests seems to be coincidental with excecss rain in the northern half of Australia and the lack of rain in the southern half of Australia. Simultaneously there seems to be a worryig number of reports of excess rain in the southern parts of South America. In Europe floods have been raging with unprecdented regularity, whilst in California fires are raging regularly due to repeated and lengthy droughts. Before we start quibbling about what is happening where, let’s consider the fact that sea levels are in fact rising. That the ocean of the world react (in human terms) very slowly to changes in climate, should give any thinking person pause for thought. If they are reflecting the effects of climate change, shouldn’t we be doing something about it? Where, please? I can’t find any estimate in WG1 of the area of Amazon forest that is or will be vulnerable to burning or dieback because of water-stress. The sole Nepstad paper referenced in WG1 dealt with vulnerability to fire but the referencing text used it in support of general, unquantified discussions of carbon sinks. Whether or not WG1 dealt with the issue, it’s clear from the work of Nepstad and others that logging is the main threat to the Amazon forests, not only directly but by reducing rainfall. More severe and frequent GHG-driven regional droughts might play a larger role in the future but as the areas most vulnerable to drought are those that are being most heavily logged (Nepstad 2004), it’s questionable whether the most vulnerable forests will still be standing by the time the droughts get worse. That’s my imperfect understanding, anyway. Happy to be corrected. That is a valid point and I haven’t had time to scour up any stats. The thing is that even the “not so vulnerrable” regions are going to be affected by human induced global warming to some extent. Anyone got any figures? When I lived in the UK 1967-81, this sort of abusive practice could be taken to the Press Council, which would investigate complaints of improper journalism and, if they proved valid, censure the newspaper and/or reporter. It would be worth checking whether that avenue remains open. Unfortunately I don’t think we have such a press ombudsman in the United States. If there is, in the peer reviewed literature, then please show it. Given that the WWF are set to make up to $60 billion on the REDD programme in the Amazon, it is a fairly major conflict of interest. The “deniers” are having a field day here….. The deniers are indeed having a field day, as they always do, despite the absence of evidence to support their case. Unfortunately for them, there is an abundance of peer-reviewed scientific literature that backs up the IPCC on this. Indeed as I’ve suggested above, if anything the 40% claim is a significant understatement. Will be posting on this in the near future – watch this space.